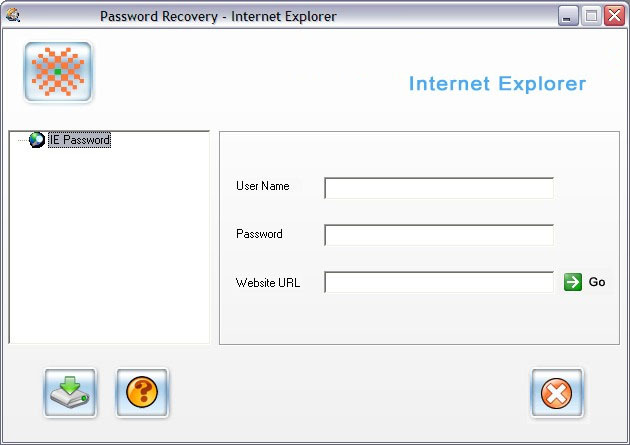 Internet Explorer Password Recovery and Windows Application password unmask tool is a complete solution to recover all type of IE (internet explorer) saved passwords that includes password for lost or forgotten Email accounts, Newspaper group, Online shopping, Magazine subscription, Web forms, Billing addresses, Search engine accounts or any password protected windows application and much more. ...... fields, MS Access database files or administrator password you forgot what it is, Data Doctor password unmask software uncover hidden password that are covered by asterisks of any windows application or any password protected text box. It successfully shows the password of any IE or nay windows application and other similar records and successfully uncovers the password of FTP Client software and ZIP, RAR, PDF, ACE files password and many more similar records. Simply provides an easy way to manage and protect the important information. And you can recover and restore lost or forgotten password ever entered on your PC. Email account passwords and logins are recovered instantly. Recover all type of internet explorer saved password list. Support all Internet Explorer versions. Support for all multilingual passwords. Restore password hidden behind the asterisks. ICQ Password Recovery can recover ICQ passwords for all versions of ICQ. My MSN Password Recovery - the program to recover MSN Messenger passwords. Dependable password recovery solution for network. Viewing and cleaning the secret data stored by Internet Explorer. Qweas is providing links to Password Recovery 2008.3.1.0424 as a courtesy, and makes no representations regarding Password Recovery or any other applications or any information related thereto. Any questions, complaints or claims regarding this application Password Recovery 2008.3.1.0424 must be directed to the appropriate software vendor. You may click the publisher link of Password Recovery on the top of this page to get more details about the vendor.